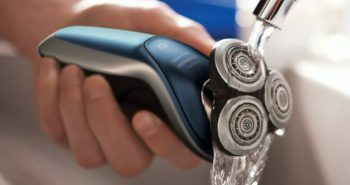 Braun and Old Spice are two popular brands that have collaborated together to make a line of cordless men’s personal grooming products. 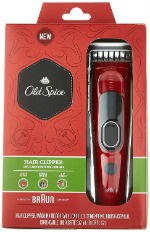 The Old Spice Hair Clipper powered by Braun is made in a slender long design with a plastic red case and black parts. The on/off black button is located on the bottom portion of the clipper, with the Braun logo beneath that. These hair clippers will make trimming your hair much easier. You’ll be able to save money from having to go on trips to the barber shop every three weeks. Simply buy these clippers and do it yourself. If you have a family of boys you can also buy these clippers and do your sons’ or your husband’s hair to save even more money. 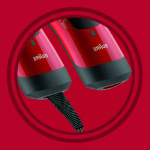 These clippers are simple to use and you don’t need to have a drawerful of attachments to use them. They can be used cordless, as they are rechargeable. After you fully charge up the unit, you’ll have forty minutes of cordless trimming time. What’s nice about these clippers is that if you run out of power on the cordless feature, you can just plug it in and continue using them. Not all of the Braun/Old Spice products are like this. The head of these hair trimmers still feature a full-sized head, so you’ll be able to effectively trim your hair quickly. The head is built with super sharp blades so that they’ll be able to give you a quick but even hair trim. They will never yank or tug on your hairs or give you any other type of trimming discomfort. 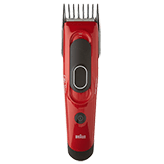 The Old Spice Hair Clipper powered by Braun is also washable, so you can use it wet or dry. You can shave in the morning in the shower if you wish. You can get one of those fogless mirrors for the shower stall so you can see what you’re doing. There is an adjustable comb called the StyleLock comb. There is a length setting for the comb which can be moved up or down with the press of a long black switch. This locks into place so you can have an accurate cut around your entire head of hair. 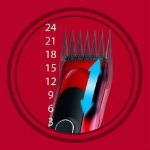 There are eight different adjustable comb settings which will enable you to have precisely trimmed hairstyles. These can be done up to 24 mm long, or 0.94 inches. 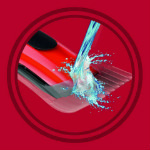 They can vary from 3 mm to 24 mm or from 0.12” to 0.94 inches. These hair clippers are extremely affordable, at under $20. You won’t hesitate to add them to your own Old Spice & Braun personal grooming cordless men’s products for your bathroom. 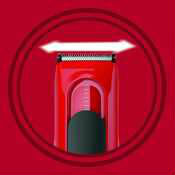 Many men may be deciding whether to purchase this brand of clippers or another brand. 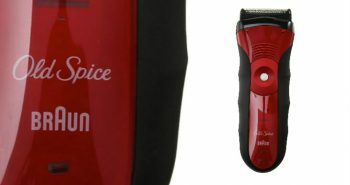 The reviews are excellent for this Old Spice Hair Clipper powered by Braun, with excellent reviews of about 4.5 out of 5 stars. 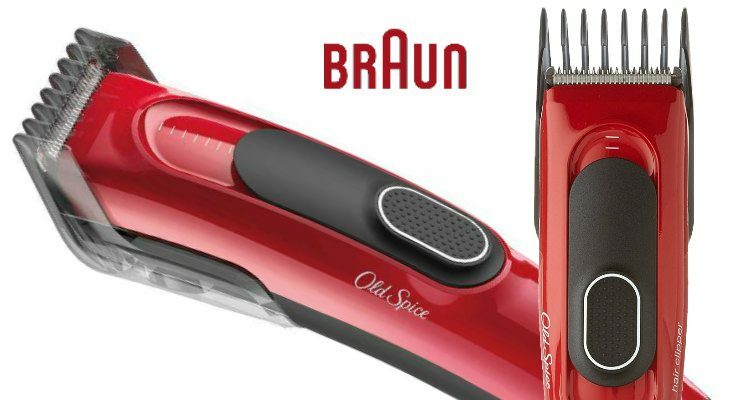 Braun and Old Spice have designed some unique hair clippers, and you’ll notice right from the start, because they are red. The clipper has a longer body so that you can easily reach the back of your head. 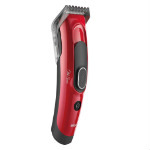 It also has long trimmer lengths than their other product: the Beard and Head Trimmer. In the package you’ll receive your Old Spice Hair Clipper, Powered by Braun, machine oil, and a cleaning brush. 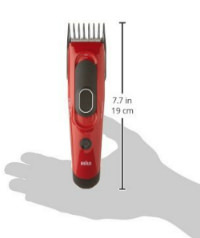 This clipper measures 5.7 inches or 19 cm tall. There may be a 60 day sellers guarantee on this product. 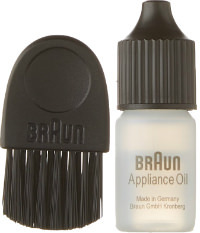 There is a two year warranty, which is generally the minimum that Braun has on all of their men’s grooming products. Inside the box you’ll receive one Old Spice Hair Clipper powered by Braun, a hair clipping comb, a cleaning brush, a charging cord, and machine oil. 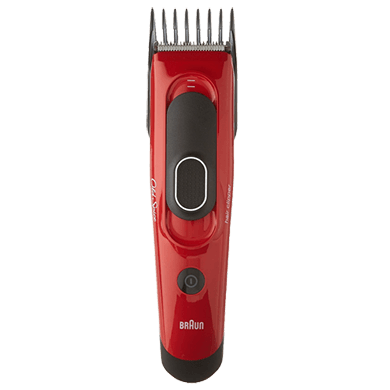 If you like keeping your hair super short but you don’t like to spend a lot of money having a barber trim your hair every few weeks, then buy the Old Spice Hair Clipper powered by Braun. You’ll find that it effectively cuts through men’s fine hair, normal hair, or even thick hair. It can be used to trim wet or dry hair and is easily washable. Start saving money by buying one today.